Don’t get me wrong…I love The Real Housewives of Potomac. They’re funny, smart, look great, and are always shady. But ladies, when you’re in France, keep your voice down, your opinions low key, your competitiveness to a minimum, and for goodness sakes, don’t scare the natives. It’s a few short days before the trip to France and everyone is just beginning their day. Karen Huger is out in Great Falls already hitting the Champagne. Hey, it’s five o’clock somewhere, maybe even in Cannes. Candiace Dillard and her fiancé Chris are doing what I suspect is all they ever do together: Talking weddings. Or more succinctly, Candiace asks him about what he wants in the wedding registry. I don’t think Chris knows what a registry is, because he answers “Get laid every night.” Sorry Chris, you won’t find that at Pottery Barn. Gizelle Bryant, her mom, and her girls are going out to breakfast. Her mom will be watching the girls while she is in France. Since the gang’s all here, Gizelle gives them an update on the Sherman situation. The girls are sad that Sherman won’t be around anymore, but they’ll be fine. Gizelle reminds them that they’ll never get rid of her. Monique Samuels is micromanaging her kids’ outfits and their essential oil therapy for the time she’ll be gone. There’s a certain way and a certain time that these kids are to get their oils and it’s all written down. My guess is that as soon as Monique leaves the mac and cheese and Oreos will be distributed and the kids will be in PJ’s all day. Essential oils will be replaced with popsicles. Guess what…they will live. 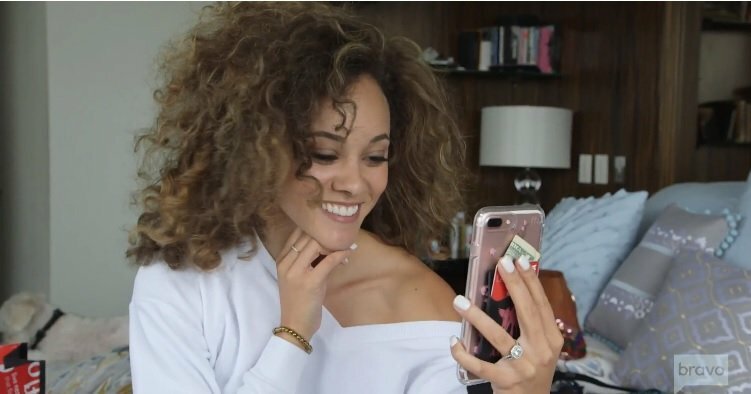 Ashley Darby is packing for the trip and Facetimes Robyn Dixon who is at home and sick. Robyn complements Ashley on the song that she sang to Michael at open mike night at Oz. Too bad Michael wasn’t as thrilled at Robyn. When Ashley got the pictures back she noticed that Michael was a little too stone-faced and didn’t show any of the emotions that she wanted to see. It really hurt her feelings, so now the ball is in his court. He needs to do something nice for her. Robyn is excited about the trip but doesn’t trust Monique’s motives. Ashley tries to make her feel better by teaching her to curse in French. It’s the day of the trip and the ladies arrive one by one and meet curbside. Once Gizelle pulls up, Karen high-tails it inside. As far as Karen’s concerned, Gizelle has been a crappy friend, and Karen is on high alert for when the BS begins. Robyn is late but apparently makes it on the plane. Everyone is in business class except for Monique and Charrisse Jackson Jordan. They decided to upgrade to first class. Gizelle is pissed that she didn’t think of it first Monique didn’t stay with the group. Gizelle then films Ashley sleeping and mentions that not only does she snore; Ashley calls out another man’s name in her sleep. The thing is there are no receipts. So is this “other man” a real person or Ashley’s hall pass? Finally, they land in France. Unfortunately, Ashley has caught Robyn’s cold. She looks so miserable I feel my throat getting scratchy just watching her. Can you catch a cold from your TV because I think I have? Monique, Ashley needs your essential oils and lots of them! Aaaanyway…Instead of taking a van to the hotel, Bravo Monique has chartered a helicopter. As the ladies head toward it, another copter lands next to them. They’re told that it is the Prince of Monaco, and Karen pretends that he’s there for her. This makes me laugh because it is exactly what I would do but apparently everyone would roll their eyes at me like they do at Karen. Oh, come on! Lighten up, ladies! You’re in freaking France! They arrive at the hotel. Monique has gifted herself the best suite, but there’s a mini-suite available next door. She offers it to either Gizelle or Robyn. She was probably hoping to start a fight, but Robyn is so passive that Gizelle is able to Ramona Singer the keycard out of Monique’s hand. Karen thinks the move was brilliant on Monique’s part. Poor Robyn, won’t she ever learn? Who didn’t get a good room? Well, that would be Candiace and she calls Chris to complain. Her view is a wall, but Chris tells her to get out of her room and see the sites. You only need the room to sleep and then your eyes are shut. Chris, stop being so pragmatic! Candiace needs to vent and you need to nod and agree. Don’t you know anything about women? Everyone meets up in Monique’s room for dinner and to get the itinerary. She wants to take them to a place that makes essential oils. Gizelle is like “Really?” No one wants to see baby oil being made, but everyone else acts excited. They’re also going to Grasse where they make perfume. Mo thought it would be fun for Karen. Karen is very appreciative. Afterward, Ashley tries to teach Karen how to twerk, but it’s going to take a lot more champagne to get that booty bouncing. Room service arrives and Gizelle asks Karen how her perfume is coming along. Remember how Karen said she was ready for whatever BS Gizelle threw out? Apparently, she thought the time is now because Karen becomes a little undone for no apparent reason. She dodges the question and then manages to insult Gizelle’s business partners. Gizelle, Robyn, and Ashley all act like it’s a big deal that Karen doesn’t want to talk about it. Ashley asks Karen if she trusts Matt. You can tell by the look on her face that Ashley has a grenade she’s about to toss. Karen says yes, she does trust him. Ashley has a source that says Matt was recently at a gay club and spilled that Karen no longer lives in Great Falls. She actually lives in an apartment. 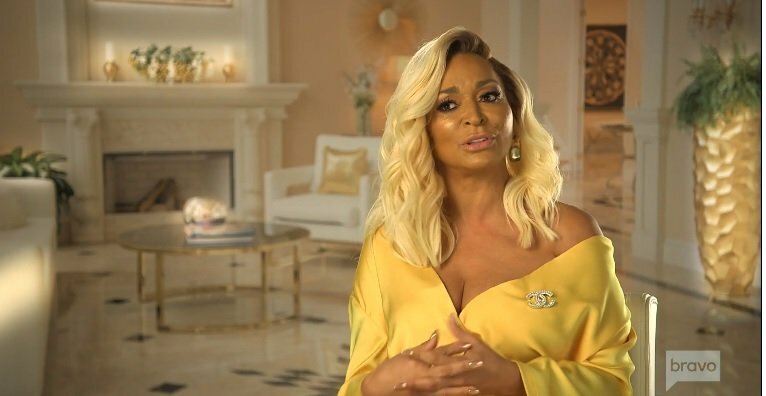 Charrisse tells us in her sidebar that Ray has an old bachelor pad and Karen has been living in it. When Ashley prompts Charrisse to tell what she’s heard, Charrisse mentions a townhouse. Karen says there’s a townhouse connected to the Great Falls mansion and her son Branden currently lives there while he saves to move out. Charrisse says that the mansion is staged and none of the Huger’s stuff is there. Ashley straight out says, “I don’t believe you, Karen.” But Karen couldn’t care less what Ashley thinks. Monique and Candiace try to stick up for Karen, but that just reminds Gizelle that she’s pissed at Monique for the first class upgrade. Monique and Charrisse had a lot to talk about and my question is why does Gizelle care since she literally told Monique that she and Robyn would be twins-ing alone and maybe doing a group thing here or there? Monique admits that she and Big Chris had a huge fight the night before she left. Gizelle asks her if it was because the spotlight is more on her not him. Robyn admits that pro athletes are used to being catered to and have huge egos. Charrisse has her NBA coach ex, Robyn has Juan, Monique has Chris, and even Gizelle, whose husband wasn’t an athlete but the leader of a huge congregation can understand the huge male ego that can’t stand his woman’s light shining brightly. It’s a real bonding moment, and also I’m sure Karen is beyond grateful that Monique took the heat off her. It’s all nice until Candiace feels some serious FOMO and pipes up to equate her status as Miss United States to the athletes. Gizelle and Monique start laughing hysterically until Gizelle can’t take anymore and goes to her room to stare at the ceiling. The next morning everyone is to meet up in the lobby to do the sight-seeing Monique had planned. Gizelle tells us that in France you’re cute at all times. After all, you never know who’ll show up, and you need to be ready. Bravo gives us some Housewives shoe-cam. Cute, cute, cute, cute….Uh, Karen? Wha da fu you wearin? But seriously folks, Karen’s shoes are made for walking and are practical. She’ll get the last laugh in a few hours. Until then, the CVS Sneakers are there to be ridiculed. Robyn is a no-show. Gizelle shoos everyone away and says she’ll wait for Robyn. They all decide to wait a while, but it’s obvious that Robyn is not in a hurry to get downstairs. Finally, they decide to go ahead. Everyone but Gizelle and Charrisse head outside to catch the shuttle. Gizelle says she doesn’t understand why Miss Perfume doesn’t want to go the perfumery (which I listened to twice and that is not what Karen said). Like a ninja, Karen is back and not only hears the conversion but tells Gizelle to knock off the BS. She tells Gizelle that Monique has planned the entire day and by the way, stay out of Karen’s business. Gizelle says every time she turns around Karen is talking crap about her business partners and it has occurred to her why. Is it because Ray wants to be with Gizelle’s business partner Erica Liles for the night? There was a Christmas party where Ray stalked Erica all night. Karen denies it, but Gizelle knows Ray would leave her in the dust for Erica. Maybe Gizelle needs to leave Karen’s marriage alone and find a husband of her own. Or maybe she should stop dating others’ leftovers. 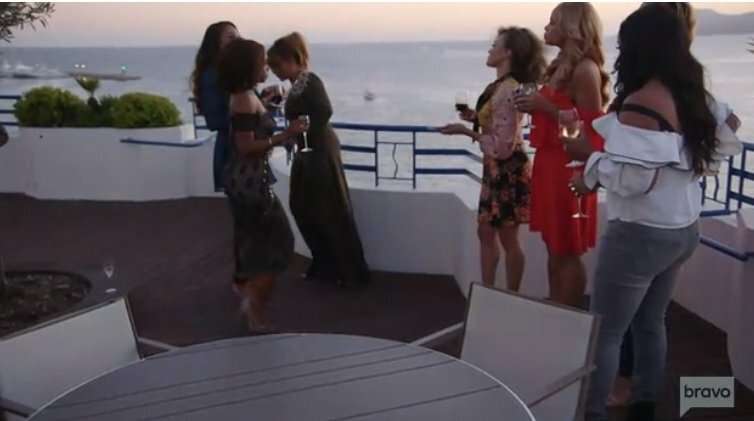 As the nervous French hotel employees look on and hope that the Americans leave without busting up the joint, the rest of the ladies come and remove Karen and Charrisse from the situation. Next week it looks like Gizelle makes good on her promise to Monique that she and Robyn will be hanging out on their own, and the rest of the ladies have a fairly fabulous time. TELL US: WHERE DO YOU THINK KAREN IS REALLY LIVING? AND WHY DO CHARRISSE, GIZELLE, AND ASHLEY CARE? IS MATT FRIEND OR FRAUD?